In these troubled times of #cleaneating, #gettheglow and who knows how many other wheezes designed to inspire guilt and remorse, especially in January, there’s something delightfully transgressive about sitting down with the sole intention of eating as much meat and fried food as possible in a single meal. And then ordering dessert. Through this prism, our recent trip to Red's True Barbecue can be seen not just as a meal, but as a politically informed act of resistance. So come brothers and sisters! Man the barricades! Comrade, pass me the hot sauce! 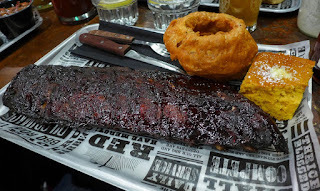 That’s my only excuse for the sheer gluttony we indulged in over a couple of hours in this recently opened outpost of the small but growing barbecue chain – 8 restaurants at the last count. 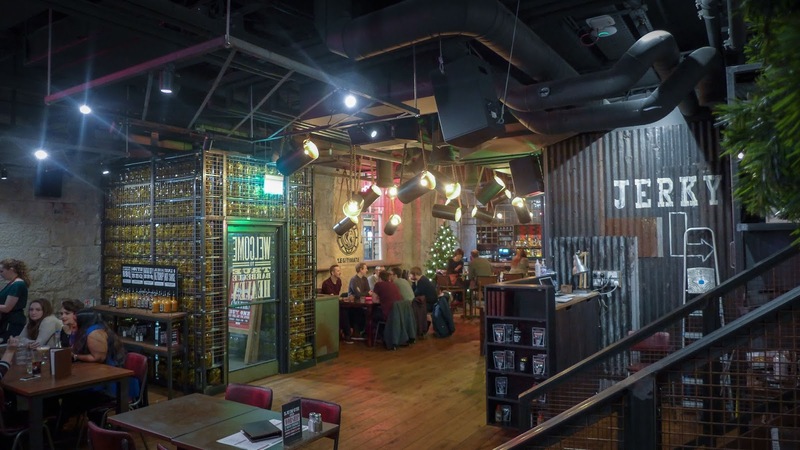 Newcastle doesn’t lack home-grown protein-centric joints, with Longhorns and Bierrex doing very capable things with their smoky lumps of cow and pig. So what does Red’s bring to the table? A whole liturgy of mock-Christian branding, for one thing. “The pearly gates of your new church of worship have been flung open in Eldon Square. 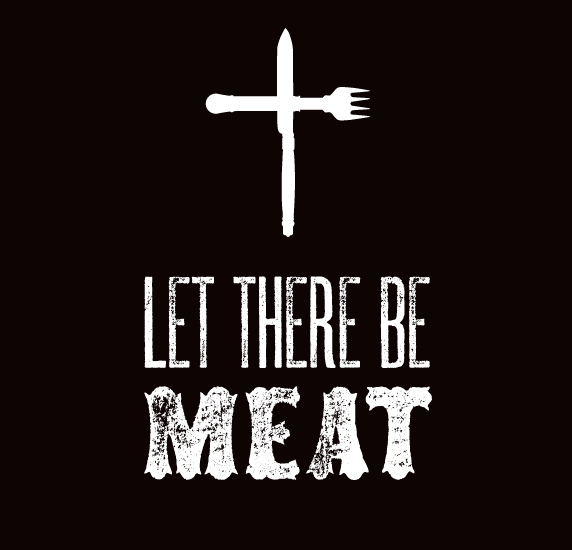 Come forth and worship at the altar of meat,” preaches the website. 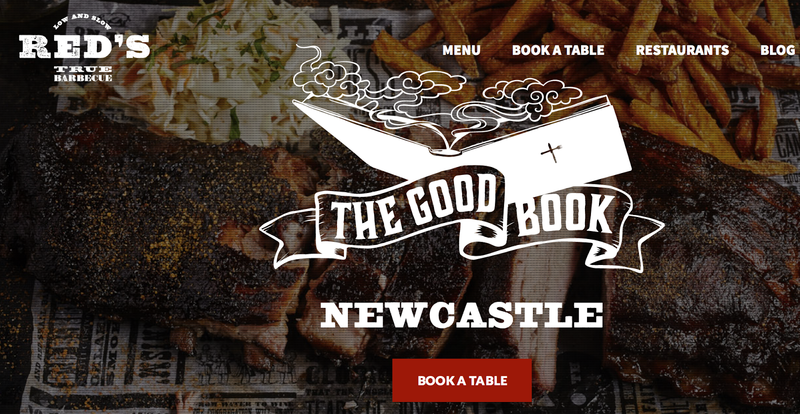 This branding, from Warm, a design company housed in a decommissioned church in Gateshead, features a knife and fork formed into a cross. 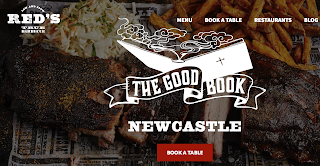 The menu is referred to as “The Good Book” and a popup on the web page urges you to “join the flock (enter email address to receive updates and offers)”. This theme-park approach to catering gets very annoying very quickly when the food isn’t good enough to distract you from it. I’m sure some may find it offensive. Fortunately, what turned up on our trays almost justified it. Almost. 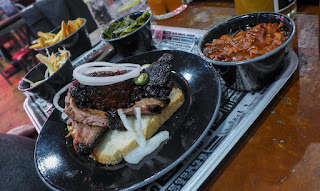 Of the four of us dining, Mrs Diner was, as usual, the clear winner, her tray of brisket and burnt ends being quite wonderful. Burnt ends, those tips of the joint that develop heroic levels of charred “bark” during their smoking, are a particular speciality of Kansas-style barbecue and on her plate they were nuggets of pure smoky gold, packing in a rare depth of flavour that justified their sixteen hour smoke. The brisket, slices of gloriously tender meat, juicy, and with a decent fat content, was the perfect textural counterpoint. My own tray of baby back ribs was not quite so revelatory. The meat was a bit dry, with whatever combination of rubs and glazes it had been subjected to resulting in a slightly one-note flavour. They were much improved by the liberal application of North Carolina BBQ sauce, a vinegar-based number with a lovely hum of pepper about it. I find most barbecue sauces to be sickly, when what I’m after is something to cut through all that sweet glazed animal fat. 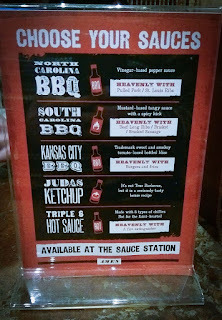 Of the other four sauces available "at the sauce station", the mustard-based South Carolina effort was particularly good. 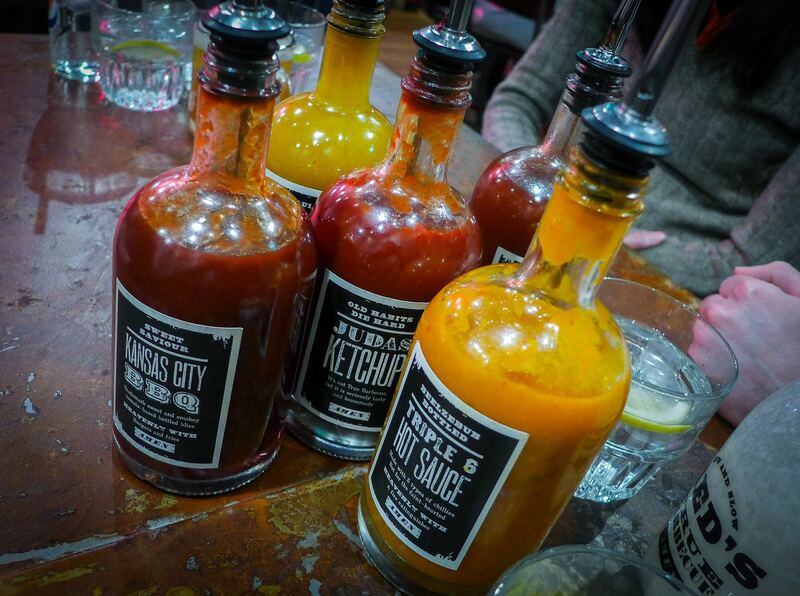 Unless you’re partial to the taste of tomato puree, or weapons-grade chillies, you can safely avoid the others. For a laugh, my friend ordered The Donut Burger. 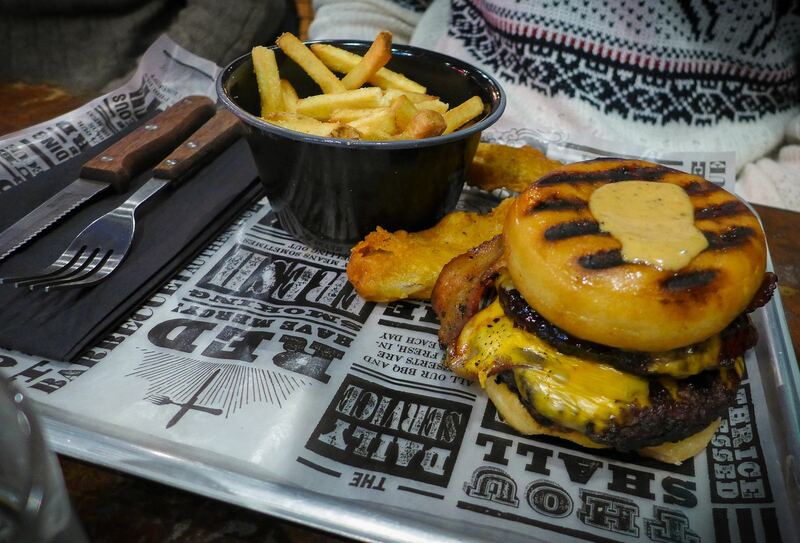 Yes, it was a burger, complete with bacon and cheese, sandwiched between two glazed donuts. Ha Ha. I tried a bit and I cannot in good conscience recommend it. To be honest, said friend is a manager in a sugar factory; perhaps he was pining for his work. The only really good things on his plate were two deep fried pickles. They call them “frickles”. The only place I’ve ever seen get these right – it isn’t easy to encase something inherently soggy in crisp batter – is London’s Meatliquor, and these were certainly in the same league. 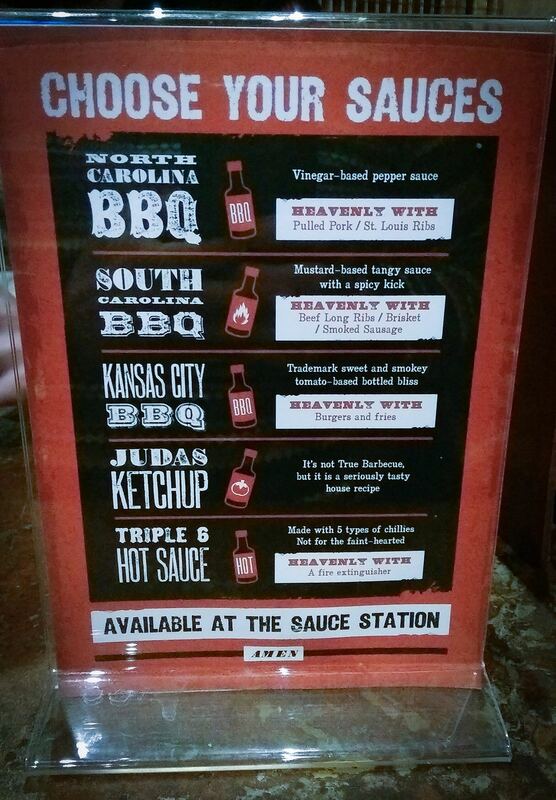 Red’s should offer them as a bona fide side or starter, not just as a burger afterthought. With lashings of their smuttily good blue cheese dip, that really would be sinful. In fact most of the sides were enjoyable, bringing much needed variety to the proceedings. Pit beans, full of meaty nubbins, were great, and I really enjoyed some fluffy sweet potato cornbread. Fries were fine and BBQ greens shone like an emerald oasis in a desert of bronze and brown. 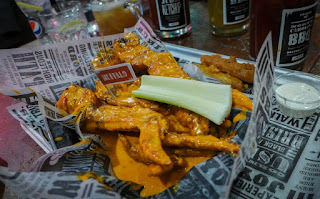 We also enjoyed a shared starter of chicken wings doused in an ocean of Frank’s-style tangy hot sauce, although why don’t restaurants see fit to joint chicken wings? Surely it’s easier for them, with their knives, than it is for me with my fingers? Mutant onion rings the size of my head were too much batter and not enough onion, and thus less fun. 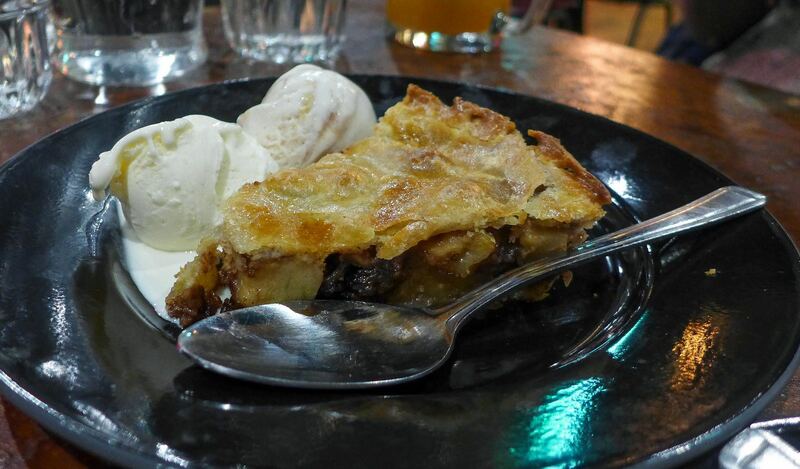 As indeed were desserts. Both the peanut butter cheesecake and the “housemade” apple pie were, to be blunt and not terribly eloquent, a bit rubbish. 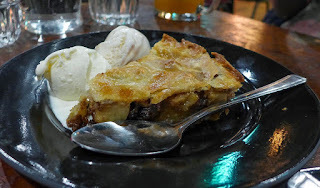 The pastry on the latter suffered from not just a soggy bottom, but also a soggy top and sides, while the former tasted rather cheap and mass-produced. “I’ve had better from Lidl,” said my friend. I have no idea if he was right. We ended up not paying for either: our waiter removed them from the bill in recognition of the fact that we had been more or less abandoned after we finished our mains. This is a quick way to get the customer back onside after a slip up. The fact that the credited amount appeared on our bill specifically as a “blessing”, made me wonder if slip ups are common at Red’s. Service was mostly friendly and competent, but no matter how casual your restaurant is meant to be, having waiting staff wandering about checking their phones when you’ve got piles of unwanted bones on your table is not a good look. If those desserts hadn’t been struck from the record our meal would have come to £25 per head, including drinks, but not service. As with all the occupants of the new Grey’s Quarter in Newcastle, the question which needs to be asked is: what are you doing that we wanted but didn’t already have? The quick answer to that is: first rate brisket, burt ends and frickles. Those are what I’ll be ordering next time. If there is one. Red, whoever he is, is no messiah, but he does know how to make a lump of cow taste very good indeed. And that, in itself, might be worth a second coming.